Ahhh, a wonderful, crisp Texas day for a pre-Saint Patricks Day celebration in the ATX. Happy Saint Patricks Day! So, I am chatting with a high tech personage and they decry the tsunami of copycat apps and startups. Not something I have noticed myself, but he made a strong and logical case for it. He convinced me. He went on to say that it was a fairly recent occurrence which made me ponder that notion. After a bit of pondering, I came to the conclusion it has been around forever. I cite as my example the history of sculpture. Yes, I can understand your natural skepticism as I am not really much of a sculptor myself, but I have a set of eyes, don’t I? So, I give you Rodin’s The Kiss and Klimsch’s Der Kuss. As you know Francois Auguste Rene Rodin (1840-1917) was a prolific sculptor who created such works as The Kiss, The Thinker, The Gates of Hell, Eternal Springtime, St. John the Baptist, The Age of Bronze. He was also a prolific drawer and painter. Many of his drawings were studies for his sculpture. I was flabbergasted to learn that he executed multiple copies of his sculptures — there are three copies of The Kiss. When I first learned this, I was certain it meant that he had cast it in bronze — something quite common and something he, in fact, did. But, no, there are three copies of The Kiss. This is a matter of some contentiousness. Rodin had a hard time getting started and worked as a hewer of stone for decades before he got his big chance. A hewer of stone made building blocks and carved details for buildings such as column caps and gargoyles. Here is The Kiss which was taken as an expression of sexual love. As always there is a story behind it. The parties in the sculpture are supposed to be adulterous lovers: Paolo Malatesta and Francesca da Rimini. They were killed by Francesca’s husband who was outraged by their conduct. These characters appear in Dante’s Inferno. Their passion was born of their reading of Lancelot and Guinevere to each other. Back story. Take a look at this sculpture. Do you recognize it? Look very carefully. It is a work by Henri-Leon Greber, a French sculptor who lived from 1855-1941 and did many sculptures including the famous JC Nichols Memorial Fountain that is in Country Club Plaza in Kansas City, Missouri. 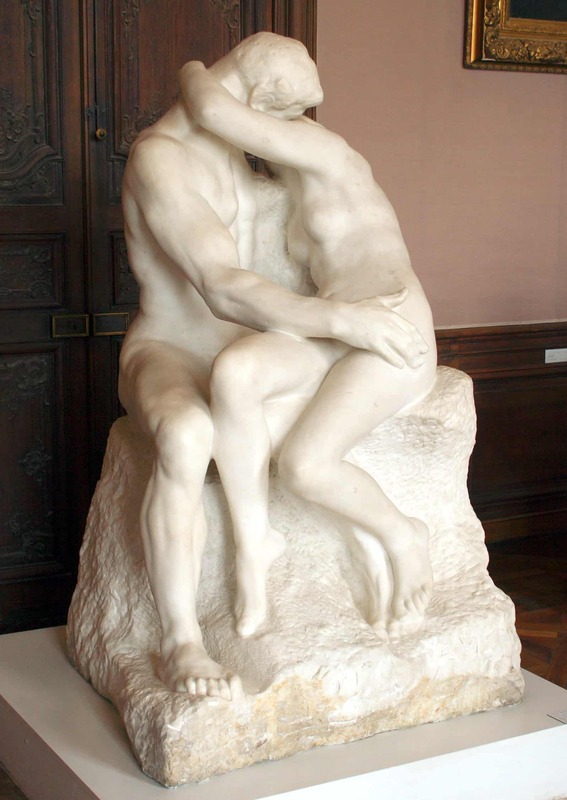 This copy of The Kiss is in Philadelphia Rodin Museum. As your eyes tell you, it is not a perfect copy. Now, go back. Can you see the differences? Fritz Klimsch was a German sculptor — one named by the Nazis as an essential German artist as noted in the Gottbegnadeten List — who lived from 1870-1960. He freely admits his work was influenced by Rodin who he visited in France (Rodin died in 1917). This rare picture shows Klimsch actually working on the sculpture though I think it was staged. As you can see the elements of the sculpture are quite similar to Rodin’s The Kiss. Do you agree? So, there you have it, dear reader. Artists have been copying each other’s work for a long time. Copycats. No discussion of kissing would be complete without a quick look at Cupid reviving Psyche with a kiss. This entry was posted in Excellence and tagged copycats, klimsch, rodin, the kiss. Bookmark the permalink.